We’ve seen several wearables when it comes to sports. Some devices are sport specific like Zepp’s system that can be used for baseball, golf and tennis. A new device, developed by Rob Crowder, an Australian entrepreneur, is designed specifically for tennis. A few years back Crowder started playing tennis and fell in love with the game. What he also found was that when he was trying to improve his game his head was filled with all kinds of thoughts and questions about the game that it was hard to focus on where to improve. He created Smash to improve the way people learn about their game. Crowder wasn’t content on the wearables that were currently on the market. You can tell just by looking at the Smash wrist band that it’s designed for a tennis player. The band itself is designed to be lightweight, unobtrusive and stand up to the rigors of playing tennis. 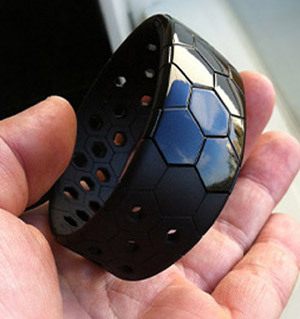 The wrist band has a design that’s made to withstand the sweat and movement on the wrist in a tennis match. This is actually a really important component of Smash. With other sports like golf and baseball there’s not as much repetitive motion and the arm isn’t constantly swinging. There’s also a lot less sweat that can become an irritant when wearing a sensorfied wrist band. After designing a band that’s better for tennis players, Crowder went on to develop the most feature packed app for tennis players that tracks all the information they need but’s still very easy to understand. 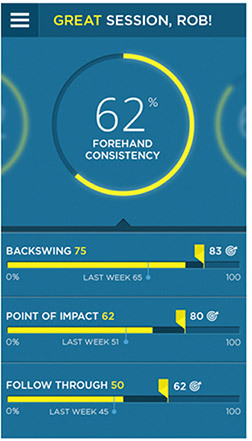 The Smash app provides an overview of the game and gives the player a consistency score for each stroke and also for the overall game. The app also allows for goal setting and gives tips and advice based on the players ability and performance tracked through the app. Smash tracks a players progress over time and measures back swing, point of impact and follow through. This shows a tennis player exactly what they need to be working on. 6-8 hours of playing time. 3 sizes available S, M, L.
LED for status and notifications. Width 27mm, Thickness 6.5mm (At tallest point). Crowder also plans on opening the Smash API to other sports as well. With hardware designed to take a beating we could see Smash as the preferred wearable for lacrosse players, hockey players and even table tennis. You can preorder smash here at Kickstarter.